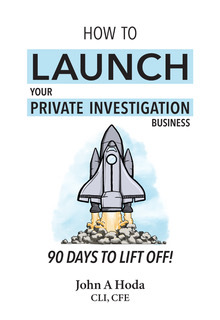 The below is an introduction and summary of a new series of books by John Hoda exploring how to successfully conduct the business side of private investigation. PInow was not involved in the production of these books. 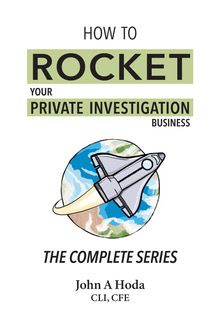 Many books, articles, seminars, and conferences deal effectively with different aspects of private investigation, but with 85% of newly-minted private investigators not renewing their licenses after two years, the real question not being addressed is how to survive and thrive as a private investigation business. For the approximately 5,000 new investigators who get licenses every year and for the 40,000 practicing investigators, keeping their business afloat is a daily struggle. Yet what is written, trained, taught, or coached on such a vital topic as maintaining a successful private investigation business? Not much. For those who are able keep the lights on through sheer determination and pluck, they are cranking out long hours every week and their work/life balance is out of whack. How can they run a successful business without sacrificing other aspects of their life? For 22 years, I have personally known these struggles and have stayed in the black, able to make payroll, and enjoy some semblance of an active life outside of my profession. Did I come into this business with an MBA or a degree in marketing? Hardly. I went to the school of hard knocks, learned from my mistakes, and refused to stay down on the mat for the ten count. I began to shift my time from learning more about my fieldcraft to learning the essentials of business. Once my mindset shifted from an investigator that was in business for himself, to a business person providing investigative services to others, the grind eased up. But getting to this stage in my career has been a challenge. In 1996-1997, I got bit by the entrepreneurial bug. With six months of savings, a ten-year-old car, a 386 computer, an AOL internet account, and a Rolodex of contacts, I obtained my private investigator license and made the big leap. My early successes were quite intoxicating and I was very close to making my goal of becoming a super regional, from Bangor to Baltimore, when a couple of national firms disrupted the industry. Local PIs providing special investigations unit and claims investigation services to local or regional clients were suddenly dropped from the vendor lists in favor of the nationals who were locked in the home offices with two-year contracts. In 60 days, I lost 55% of my customers and that is when I had to learn about business to survive. 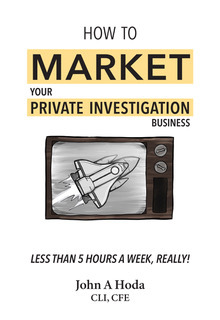 I became a student of business and found very few resources related to private investigations. I recall an early group coaching class where I was in attendance with a variety of business owners, from a HVAC company, a pest control company, a landlord-tenant lawyer, and a used-car dealer. It was during these years that I began cobbling together a business approach that kept my business afloat. Was I wildly successful? At times. Did I ever have to pivot? Twice. But in the end, as I am closing out my career, I have a lifestyle business with loyal customers and an exit strategy. I am able to look at an earlier retirement than I thought possible after the housing collapse of 2008-2009. 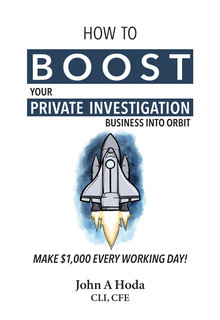 I would like to give back to the profession that has served me so well for three decades so I wrote a series of books about the business of private investigations. They will be on all major retail platforms in Spring of 2019. I asked my closest friends in the business, who also are industry leaders, for their honest opinions of the books. They shared the same experience, wishing they had had these books when they started their careers. Reading them would have saved each one so much grief, heartache, wasted time, and money. The fellow investigator colleagues also liked the unique method used to explain the different concepts. I created three characters who readers follow on their journeys from launch, to overcoming adversity, and finally to the next level. By design, I had them work in different verticals with different customer bases. All the while, I interspersed a few of my own stories of near failures and successes. I didn’t want to fall into the trap of providing only one path to success. My way was unique to my circumstances and, while I can offer actionable takeaways, I wanted to give the readers other paths to consider as well. Launching a private investigation business is a noble endeavor. The ability to provide unique services to customers in need can be very fulfilling. I want to give fellow investigators the tools, help them with their mindset, and break down complex business issues from practicing investigator to practicing investigator. I try to take the mystery out of marketing with very concrete steps that work and don’t have to be time consuming. Lastly, for those investigators that though sheer will and determination will not quit, I give them a clear path to follow on their journey up the mountain.